Box Text: This means war! The battle lines have been drawn, and an elite group of sly strategists is massing troops at your borders. You'll have to command ground, air and naval forces if you hope to survive the coming wars, and it won't be easy. With the 114 maps to battle on and both Single-Pak and Multi-Pak link modes, Advance Wars brings turn-based strategy to a depth never before seen on a handheld! *Rally the troops! War0time strategy comes to the Game Boy Advance in an epic battle simulation game. *Multiple modes of military mayhem! Fight through the war-torn Campaign Mode, pass your Game Boy Advance around in Versus Mode, or go head-to-head with fellow generals in Link Mode using the Game Boy Advance Game Link Cable (sold separately). *Create your own worlds! There are 114 battlefield maps to choose from, but that's just the beginning. Use the Map Edit function to create your own battlefields and swap them with your friends for unlimited replay value! 05-24-2016 Box Text This means war! The battle lines have been drawn, and an elite group of sly strategists is massing troops at your borders. You'll have to command ground, air and naval forces if you hope to survive the coming wars, and it won't be easy. 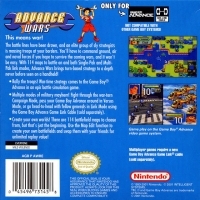 With the 114 maps to battle on and both Single-Pak and Multi-Pak link modes, Advance Wars brings turn-based strategy to a depth never before seen on a handheld! *Rally the troops! War0time strategy comes to the Game Boy Advance in an epic battle simulation game. *Multiple modes of military mayhem! Fight through the war-torn Campaign Mode, pass your Game Boy Advance around in Versus Mode, or go head-to-head with fellow generals in Link Mode using the Game Boy Advance Game Link Cable (sold separately). *Create your own worlds! There are 114 battlefield maps to choose from, but that's just the beginning. Use the Map Edit function to create your own battlefields and swap them with your friends for unlimited replay value! 08-10-2011 desocietas Box Text This means war! The battle lines have been drawn, and an elite group of sly strategists is massing troops at your borders. You'll have to command ground, air and naval forces if you hope to survive the coming wars, and it won't be easy. 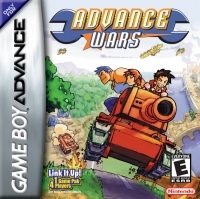 With the 114 maps to battle on and both Single-Pak and Multi-Pak link modes, Advance Wars brings turn-based strategy to a depth never before seen on a handheld! *Rally the troops! War0time strategy comes to the Game Boy Advance in an epic battle simulation game. *Multiple modes of military mayhem! Fight through the war-torn Campaign Mode, pass your Game Boy Advance around in Versus Mode, or go head-to-head with fellow generals in Link Mode using the Game Boy Advance Game Link Cable (sold separately). *Create your own worlds! There are 114 battlefield maps to choose from, but that's just the beginning. Use the Map Edit function to create your own battlefields and swap them with your friends for unlimited replay value! This is a list of VGCollect users who have Advance Wars in their Collection. This is a list of VGCollect users who have Advance Wars in their Sell List. This is a list of VGCollect users who have Advance Wars in their Wish List.